A funerary stela, on which, below four lines of inscription, the stela's owner stands at the left before an offering table surmounted by three jars, a trussed fowl, a khepesh-leg, and a leek. Facing him are four members of his family: a small male child, the owner's wife, another male child and a female child. The first two have a column of text behind them, and the latter two have a column of text above their heads. 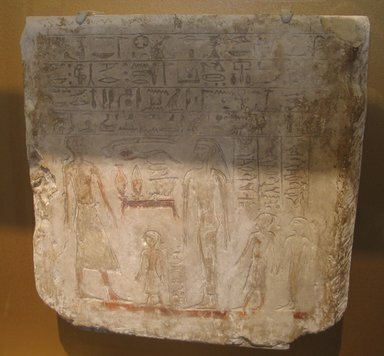 The hieroglyphs in the main text and in the single columns are all oriented to the right. The text is a simpe htp di nsw formula. No titles are given but the names listed are Nht (the small male child); Sbk htp (the wife); Sbk nht (the second made child); Idnw (the female child); Nfr skw (the owner). The molding on the right and left hand sides of the stela is broken. A vertical scar runs down the right side of the face of the stela. Although it appears to be restored, it is not. Sometraces of paint appear on the offerings and on the offering table as well as on the feet and legs of the owner and in places on the other figures. Traces of paint also appear along the base line.